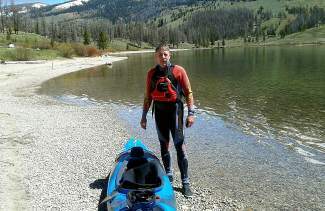 Bryan Brown prepares to start the first half of his historical trip at Green River Lake in Wyoming. Imagine spending 90 days kayaking 2,400 miles alone and without support on the two main tributaries to the lower Colorado River, with only enough gear that can be stuffed into the small boat, and being the first man to ever complete such a trip. Bryan Brown, 57, of Los Angeles, Calif., recently completed the first ever source-to-mouth solo trip of the two primary tributaries that form the lower Colorado River, according to his own research, in just longer than four months. “I didn’t do it solo because I wanted to be alone in the wilderness, I did it solo because I couldn’t find anybody else who would do it,” Brown said. The first part of the long journey started in Green River Lake, near central Wyoming, and ended at the Mexican border. The second part of the trip started at Grand Lake and ended at the confluence of the Green and Colorado rivers. The first portion of the trip followed John Wesley Powell’s famous 1869 exploration trip of the Green River and the Grand Canyon. “John Wesley Powell himself could not do this trip today the way he did in 1869,” Brown said. Today you have to secure six different permits from four different river management venues to follow the trip, and the catch is all of the permits are decided by a lottery system so getting permits that run together can present one of the hardest challenges for completing the trip. Brown dedicated the first portion of his trip to his brother, who died last year after a long battle with muscular dystrophy. “During his long illness he planned this trip, not for him to take, but for me to take,” Brown said. After Brown’s brother died, Brown decided to take the trip as a tribute to him. Brown completed the second portion of the trip to set history as the first man to complete the float of the two main tributaries to the lower Colorado River. Brown packed the bare essentials for his trip, which included one set of clothes to paddle in, one set of clothes for the evening, a one-man tent, and a sleeping bag. He lived off of food he could pack in his boat and attain by hitchhiking to the nearest gas station when he happened upon a town. He also came across some genuine people, he said, including a group of raft guides who helped him through the treacherous Gore Canyon below Kremmling that is rated a Class 5. “Gore Canyon is the definition of a gnarly Class 5,” he said. Brown portaged all of the dams he needed to cross on his own and fared the elements throughout the 90-day trip without support from anyone, except for the great people he met along the way that helped to make the trip even more enjoyable, he said.